There are many differences between a Wedding Producer, and a day-of Director - who only performs on the day-of the wedding (many times with little or no time invested in laying out a plan ahead of time)! Our company provides both services but we feel it is so important that our clients know the difference between the two. We never provide day-of Directing without first, investing the prep time and diligently working as your pre-Wedding Producer. Take a look at our blog bout the duties of a Wedding Producer versus a Venue-Enforced "Planner". As your Wedding Producers, we begin to diligently work to help you many months prior to your big day. A wedding Producer should be asking you all of the questions that apply to every detail of a wedding ceremony, and reception. You will be advised on such things as - ceremony escorting tradition, who sits where, traditional orders for ceremony procession and much more! Valerie and I work very hard to ensure your important details, are done your way. First, we will meet with you, face-to-face to go over our contract. Check out our blog article all about wedding paperwork, titled: Wedding Contracts: 8 tips to understand wedding paperwork. During our meeting we will give you a very detailed, yet easy-to-understand questionnaire document. When you have filled out and returned the paperwork - we will set a date to have a phone conference to go over all of the details. We use the information gained during our phone conference, along with the questionnaire to create your custom Wedding Day Screenplay. Our unique Wedding Day Screenplay is our most reliable resource in being fully prepaired to be in charge of directing your family and wedding party, for your rehearsal, ceremony and reception. We are always ready to provide experienced-based guidance, on any wedding tradition, or proceedure questions. 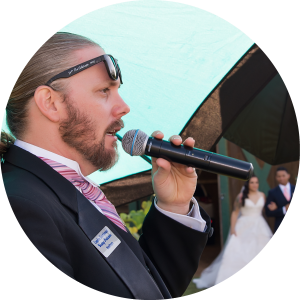 To learn more about how we carry out our duties as your Wedding Directors, on the day-of the wedding the rehearsal, ceremony and reception, check out our Directorial Services Page to know more. In addition to all of the obvious perks of having an experienced wedding professional to help with all of the prep work - we also will guide and assist you to find other wedding service providers! We can recommend at least a couple reliable, and reasonably priced service providers for most any wedding need you might have. And, we will always give you the most honest information about what service providers or venues will be a best fit for YOUR personailty, needs, and style - we do not work for, or worry about telling the truth if something will not be good for your wedding vision. Complete Entertainment offers the bonus of many essential wedding services with one contract! © 2018 Complete Entertainment Wedding Productions. All Rights Reserved.